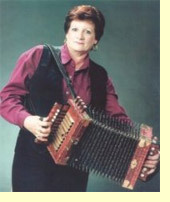 The first Cajun female accordion recording artist to be inducted into the Acadian Museum's Living Legends, Sheryl Cormier is sometimes referred to as "La Reine Cadjine" (The Cajun Queen). Kermit Bouillion, Museum program director said, "It is noted that Cleoma Falcon was the first woman to record Cajun music, but she recorded on the guitar. Sheryl Cormier will go down in history as the first Cajun female artist to record playing the accordion." Sheryl Cormier was born in Grand Coteau on March 15, 1945 and moved to Sunset as a young child. Her father was a sharecropper and played the accordion while her mother played the drums. She taught herself to play the accordion at the age of seven by sneaking her father's accordion while he was working in the fields. Since both of her parents were musicians, she would go with them to the "French dances." When it was discovered that she could play the accordion, she started making guest appearances at local nightclubs around the Opelousas area. By 1978, she formed her own band and achieved her childhood dream of having an "all girl" Cajun band. For a while, it was the first and only group of its kind in Louisiana, something rare in the male dominated music scene 20 years ago in South Louisiana. Cormier credits Blackie Forrestier in opening many 'doors' for her while he performed in the Lewisburg area. She also admits being influenced by the style of Nathan Abshire, Aldus Roger and Lawrence Walker, thus allowing her to develop her own unique style. Cormier said, "I really like to listen to Mr. Lawrence Walker's style and Mr. Nathan Abshire. Developing my own style was very difficult at times because I was a lady. I didn't always feel comfortable playing because of that." Having overcome the gender problem, Cormier has, over the past thirty years, successfully recorded 45's, LP's and CD's. She has played all of the major Cajun festivals and has played in all but three or four states. She has performed in Canada, and most of the countries of Europe. In just the last 7 years, she has played in Austria, England, France, Germany, Holland, Italy, Scotland, Switzerland and Wales. Cormier has performed at the annual Cajun French Music wards, the Festivals Acadien, and the Jazz Fest in New Orleans. In August of last year, Sheryl and the Cajun Sounds appeared at the Unites States Capitol for a noon-time concert. She then performed at the Millenium Stage of the Kennedy Center in Washington, D.C. and then traveled to Nashville to perform with Jimmy C. Newman. She has also performed at such diverse festivals as the Long Beach, California Cajun/Zydeco Festival to the Bluegrass Festival in Wisconsin. She was inducted onto the Cajun Hall of Fame in 1997 and was nominated for the prestigious Grammy Award in 1993. In 1989, she and her band received the "Best Upcoming Band" award from the Cajun French Music Awards and in 1989 she won "Best Song" from the Cajun French Music Awards for her song titled "Mon Couer et Mon Amour". In 1988, The Times of Acadiana voted her as Female Vocalist of the year; in addition to that she was awarded the best Contemporary Artist for 1988.